What could be better than a beefy, powerful custom system running the latest hardware Intel and NVIDIA have to offer? A TINY, powerful custom system running the latest hardware from Intel and NVIDIA. As last year has shown, six cores with twelve threads is a lot of power, and the Z370 platform has delivered on those power promises. Now, with the Z370 well into maturity, the inevitable has come to pass: miniaturization. The ASRock DeskMini GTX/RX has arrived to take Z370 to a new level, a new and very small level. The STX motherboard that lies at the heart of the DeskMini GTX/RX is literally a fraction the size of its ATX counterparts. However, the Z370 chipset this tiny board runs is fully capable of delivering that six-core, twelve-thread performance of Intel's Coffee Lake. Boasting a case volume of just 2.7 liters, the ASRock DeskMini GTX/RX comes equipped with an MXM graphics card from NVIDIA, up to a GTX 1080. The model I am examining today is equipped with a GTX 1060. Featuring a sleek matte black and brushed aluminum exterior, the ASRock DeskMini GTX/RX promises to fit in at the office just as neatly as at the LAN party. 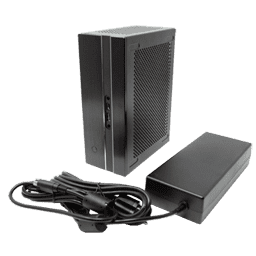 Indeed, the minimalist functionality of the ASRock DeskMini GTX/RX is a large part of what sets it apart from its small form factor competitors. 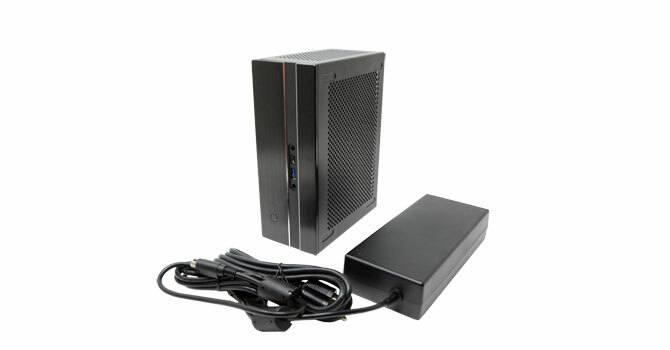 The system comes equipped with the graphics card of your choice, the STX motherboard, power adapter, and M.2 WiFi card. You can drop in the SO-DIMMs of your choice, with two slots supporting up to 32 Gb. The ASRock DeskMini GTX/RX also features three M.2 slots and two SATA ports. That's right, there are more M.2 slots than SATA ports; a new and wonderful paradigm awaits. 2.7 liters is certainly an impressive metric, but can ASRock deliver the big performance promised in this tiny package?